Our painted fabric is now ready for the next stage where we will define the different areas of the flower with color and stitches. Remember that any number of these blocks could be created for a larger project, such as a quilt. Look at your project and decide where you would like to divide the various sections, i.e., the center, the petals, the surrounding areas. This should be easy to do since the salt would leave some of the defining areas mottled. With a sharp chalk marker, draw around the center section, the petals, and the outer areas. Of course, your wall ornament may be completely different from mine, but I think you get the idea. Cut batting and backing a little larger than your project and sandwich together using 505 spray or whatever method you prefer. 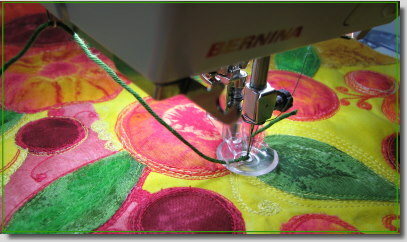 Prepare your sewing machine for free motion quilting, making sure the feed dogs are lowered. 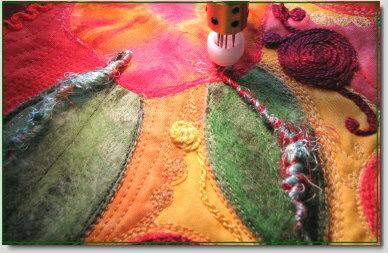 For the center of the flower, use a light colored thread that coordinates well with your fabric. Free motion whatever design you like in this area. I began by sewing around the perimeter and then working towards the center. 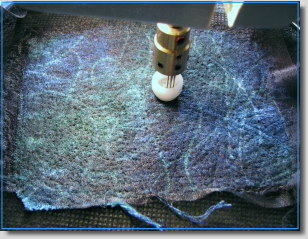 Thread your machine with a darker thread and use a different motif to free motion quilt the next area. I used navy thread and the garnet stitch, making circles and ovals with my needle. Remember, it is the contrast of colors and stitches that gives this piece its visual interest. 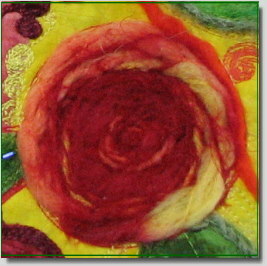 Now return to a lighter color thread and begin outlining your flower petals. 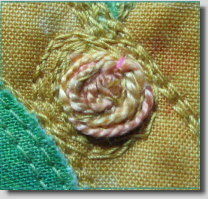 Add a little dimension to the upper petals with three or four short lines of stitching radiating outward. When your petals are compete, thread your machine with a darker thread and once again free motion quilt with a new motif. 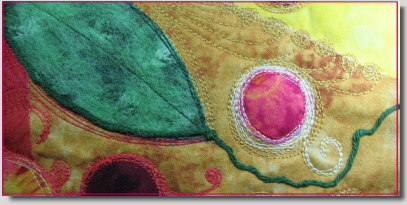 I used a meandering stitch in this area. Continue in this alternating pattern until you finish your quilted project. 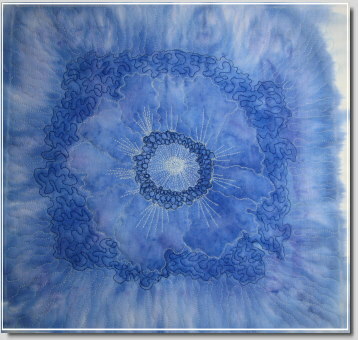 Dimensional objects in fabric painting can reward us with spectacular outcomes that open up new avenues of creativity. I hope you will think of this tutorial as a mere starting point. Each year as spring arrives, I think paint. 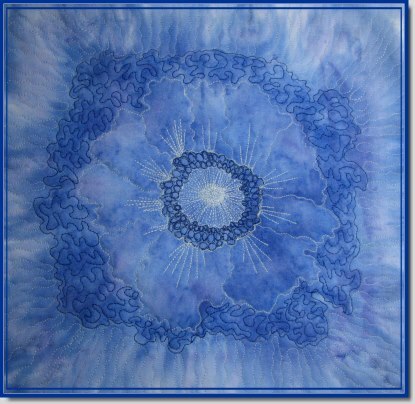 What could be more exciting in the world of fiber art than not knowing what the alchemy of fabric paints, salts, gels, powdered pigments, sponges, brushes, and a little time will render? It’s a surprise every time and I love it! 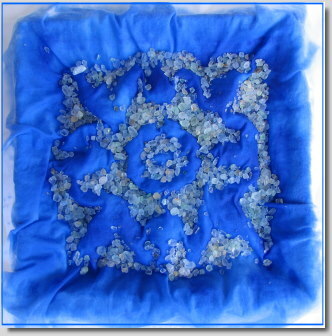 For this fiber play, you will need some white Kona or pima 100% PFD (prepared for dying) cotton fabric, a sponge applicator, a dimensional plaster (or metal) decorative wall ornament, a bottle of Pebeo Setacolor transparent fabric paint, rubber gloves, plastic wrap, and some rock salt. Commercial fabrics are often treated with finishes that will resist the absorption of paint. If you’re not sure whether your fabric is PFD, wash it first with Synthropol or a small amount of laundry detergent. Do not use fabric softener in the rinse water. Additionally, fabric paint can permanently stain your clothing, so it’s a good idea to wear a protective cover over your clothes or older clothing designated just for this purpose. When fabric painting, I use a foamcore board purchased from an art supply store as my base. It’s lightweight and easy to cover with a drop cloth, large trash bag, or vinyl. I also keep a spray bottle (filled with water) and paper towels handy. A book on mixing colors is also a helpful aide. There are many on the market from which to choose. 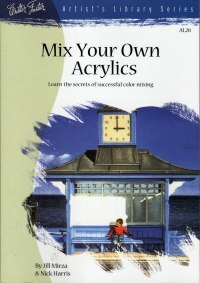 I like Mix Your Own Acrylics by Jill Mirza and Nick Harris (published by Walter Foster Publishing, Inc). There is a short section on color theory followed by color galleries filled with easy ratios to follow in your own paint mixing. 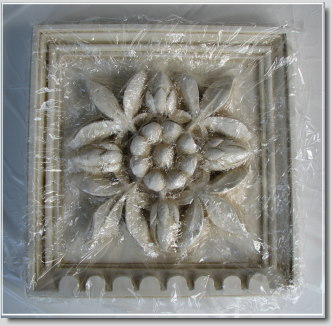 I purchased the decorative wall ornament at T. J. Maxx, but I’ve seen similar home decor pieces in numerous stores. You shouldn’t have any trouble finding these. Now, let’s get painting. Prepare a level surface along with your foamboard by covering them with a drop cloth or plastic sheeting. Place your decorative wall ornament on top. Cover it with plastic cling wrap (such as Saran Wrap) to protect it from the paint. Next, drape your cotton fabric on top of the ornament and mist it with water until damp (about the dampness of clothing coming out of the washing machine). Put on rubber gloves and pour a small amount of fabric paint (I used ultramarine) on a damp sponge applicator. 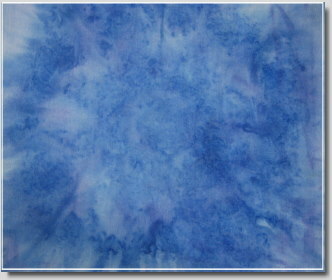 Quickly spread the paint across the surface of the fabric, making sure you leave no white areas. Paint the fabric a little beyond the edge of your ornament. Wash you sponge applicator immediately and set aside. 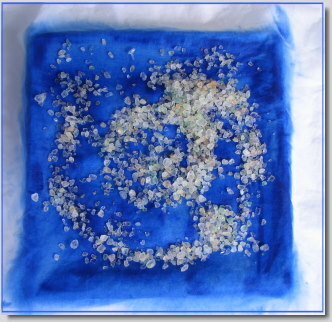 Now take some rock salt and sprinkle it on top of your painted fabric. Begin pushing the fabric down into the crevices of the ornament, allowing rock salt to fill the little valleys and hold the fabric in place. Leave your work to dry. On hot days, this could happen very quickly. Conversely, on damp days it could take hours. 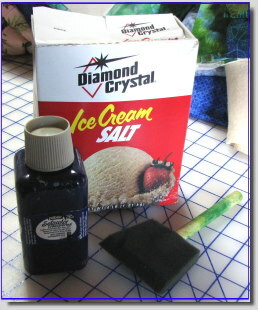 As soon as your piece is dry, remove the salt and shake the fabric. Sometimes little pieces of salt stick to the fabric. These are easy to remove by hand. Setacolor paint must be set by heat to be permanent. Cover your ironing area with an old towel or piece of scrap cloth and iron your work at the cotton setting for a few seconds. That’s all it takes to fix your colors. Hopefully, you see the faint impression of your decorative ornament. In part two, we will define the lines and fill our painted fabric with stitches. The final stage of this secondary thread work involves working with perle cottons #3 and/or #5. These heavier threads cannot go through a machine needle so we must use other methods. The most common way of using these decorative weight threads is through bobbin work. 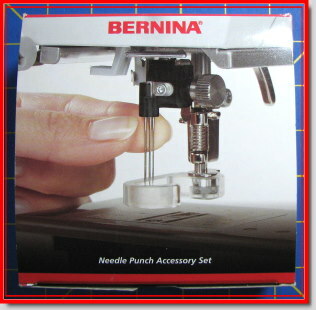 Before the day of specialty bobbin cases, I would simply bypass the tension mechanism on my Bernina 1230 and bring the bobbin thread up directly. This worked okay for very heavy threads and ribbon floss, but wasn’t ideal. 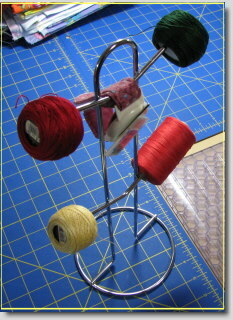 I then purchased a second bobbin case and made adjustments as I mentioned in part three. 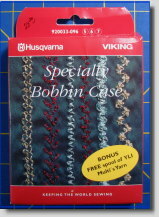 Sewing machine companies now produce specialty bobbin cases, and if you like using decorative threads in your work, they are a nice accessory to have. 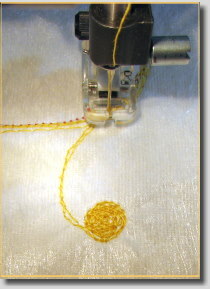 To begin the second phase of heavy thread work, hand wind your bobbin with perle cotton #3 or #5, place it in the specialty bobbin case (or adjusted secondary bobbin), and set up your machine for free motion embroidery (according to your previous test results), making sure the feed dogs are in the down position. 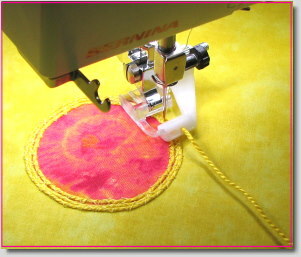 Turn your work to the backside and position the needle at a point on the circumference of one of your circular flowers. Sounds like geometry, doesn’t it? Now check to make sure the bobbin thread tail is positioned towards the back of the machine so that it doesn’t get caught up in the securing stitches and make an unpleasant mess on the front side of your work. Take a few slow securing stitches moving every so slightly forward, clip your top thread tail, and then begin working your way around the circle. Before the second pass, clip your bobbin thread tail. 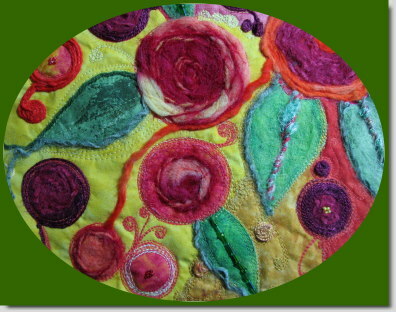 On the second pass, work some spirals, scrolls, and circles in the areas surrounding your flowers. When you are happy with the decorative bobbin work around your flowers, go back to some of the flowers and fill the interior completely with stitches, working in a spiral motion. 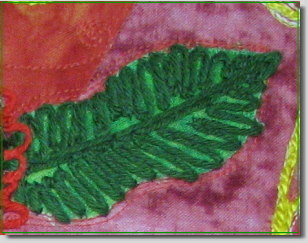 Next, work some vein stitching on one or two of your leaves. 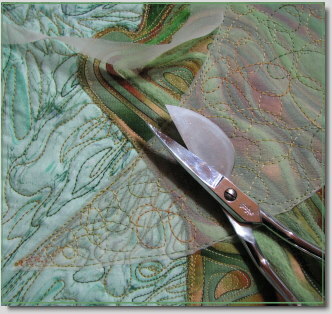 On other leaves, work a row of stitching down one side and continue in a winding motion past the tip of the leaf. 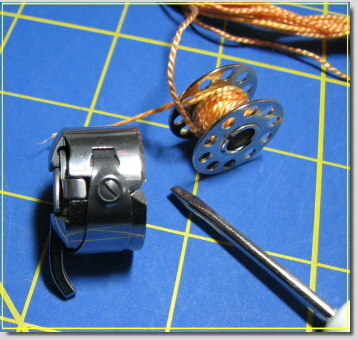 An alternative to free motion bobbin work would be standard bobbin work. 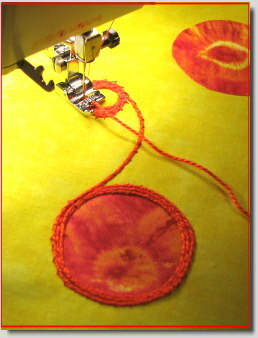 Keep your feed dogs in the normal up position and sew around your flower circles from the back side of your project. It’s possible to make scroll designs around your flowers using this method, but you will need to keep your lines simple. Another alternative would be to use a couching or braiding foot and couch the thicker threads around your flowers. 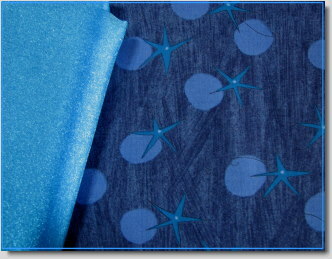 Couching allows you to use a contrasting top thread color to add even more interest to your work. Make sure you switch to a needle plate that allows for zig zag stitching and adjust your stitch length and width. Leave a small top thread tail and sew over it in your second pass. Work slowly so that you can keep your thread close to the previous round of stitches. When you complete your couching, do a few stationary zig zag stitches to secure your thread and then clip it. If you have this accessory, I recommend that you move your needle one position to the right and set your machine on a zig zag stitch width of 1.1 mm. This helps to catch the threads or yarns with every stitch. Some decorative threads are too thin (perle cottons #8 and #12) or too thick for this foot, but many work well. I especially like using this foot with perle cotton #3. One of the special stitches in Gilded Gardens is the pod stitch. This stitch is formed by building repeated rounds of stitches on top of each other. I created some of my pod stitches with the Bernina Free Motion Couching Foot and some with bobbin work. Your feed dogs must be down in order to work on such a small design. Begin by forming your outer circle and then spiral in towards the center, allowing the thread to build up on top of itself. 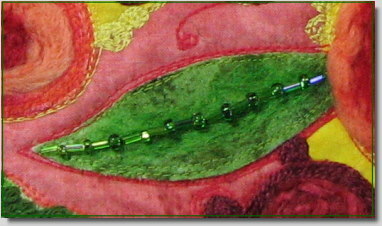 You can only go so far with this before your machine needle or bobbin case will say “enough.” By that point, you should have a nice round pod decoration formed on the surface of your work. I would suggest that you practice this on a test piece before attempting it on your project. So, with all the above options, you’re sure to find one that suites you well and aides you in completing this phase of the project. Your work should now look complete. However, we still have several flowers and leaves that beg for further embellishment, which they will receive in part five. We now have our background and garden contents stitched down and embellished with various decorative free motion stitches. We could call it a day at this point and still have a nice piece of appliqued floral artwork. However, why stop the fun when there’s so much more of it to be had! There are multiple ways to use these threads with your sewing machine, so if one way doesn’t work for you, another probably will. 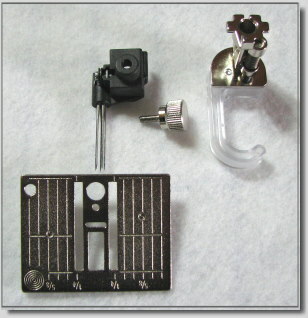 Additionally, sewing machine companies have responded to the demand for specialty feet and bobbin cases that make using these threads much more pleasurable. I will be mentioning a few that I’m acquainted with, but it’s best that you check with your own dealership to see what’s available for your particular sewing machine. 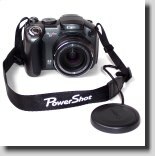 Even if you have no desire to purchase more gadgets, you can still complete this project using simple tools. 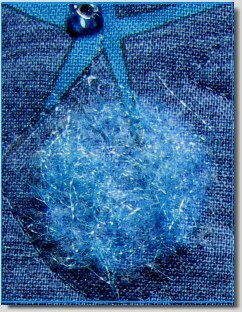 Perle cottons #8 and #12 can be stitched with a topstitch needle or jeans/denim needle, which have larger eyes. I used needle sizes 90/14, 100/16, and 110/18. 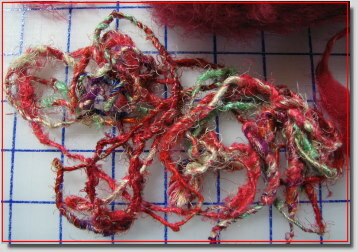 When using thick threads through the needle, wind your bobbin with a heavier thread as well. I used 35 weight cotton, but any heavy weight thread up to the size in the needle could be used. 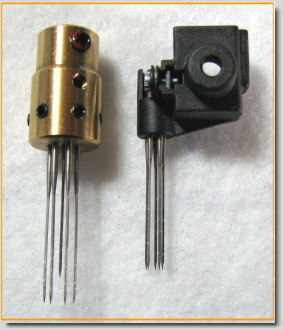 You will need to adjust your bobbin case to accommodate thicker threads. I recommend that you keep an extra bobbin case on hand just for heavier threads, and mark it so that you don’t get it confused with your regular bobbin case. 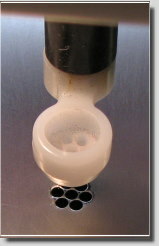 Since threads come is various weights, this bobbin case will need to be adjusted with each use. When making adjustments, place the bobbin case in an enclosed area, such as a bowl or Rubbermaid container, so that the little adjustment screw doesn’t get lost in case it falls out of its hole. You only need to remember one thing when adjusting bobbin screws: right is tight. Make all adjustments in small increments and then test your stitches. If your bobbin work is loopy, turn your bobbin tension screw to the right to tighten it (remember small increments). If it lies on the surface undefined, turn your screw to the left to loosen the tension. You may also need to adjust your top tension to get the stitches you desire. Make notes of combinations that work well (e.g., 35 wt @ 2 o’clock) so that you can refer to them in the future. 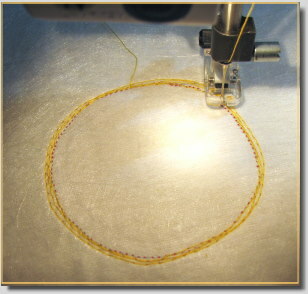 Testing your stitches is crucial to the success of your projects, so please don’t skip this step. Now, let’s begin. Using a topstitch or jeans/denim needle, thread your machine with a #8 or #12 perle cotton, and fill your bobbin with a heavy thread. Loosen your top tension. Perle cottons feed well from a thread stand. I actually used a coffee cup holder that I purchased from a kitchenware store and have included a picture so that you can see what a perfect thread dispenser it makes. If you leave your feed dogs in the up position, use an open embroidery foot for clear visibility (although I used a standard presser foot with no problem). Also, increase your stitch length to about 3.5 mm. Begin stitching around some of your flowers. Do not sew into previous stitching since this will cause your thread to fray and break. Make several passes until you are happy with the way your flower looks. We will be using heavier threads in the next stage and yarns in the final stage, so leave some flowers bare, including your center flower (unless you would like to complete your garden at this stage). 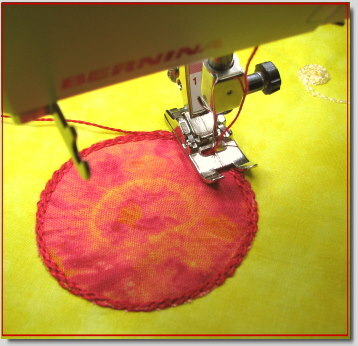 To form your spirals, scrolls, and circles, you will need to lower your feed dogs and switch to a free motion embroidery foot if you haven’t already done so. I’m not going to tell you that this is an easy, carefree technique. 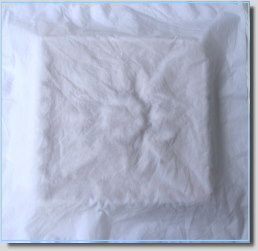 If you move your fabric too slowly, you may very well have an instant bird’s nest form on the back of your work. At the same time, you don’t want to run your machine so fast that you fray your thread. I recommend using perle cotton #12 since it is finer than #8. 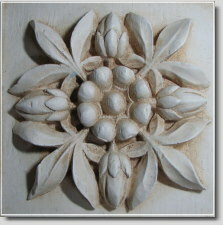 Practice on a test piece in order to become comfortable with the technique before attempting it on your project. The results are worth the extra effort, I assure you. However, if your machine is too finicky or you’re not at ease with the technique, don’t worry. Either skip this step or use a heavy embroidery thread to accomplish the same task. I used a 20 weight thread on my test piece with no problem and the results were similar to the #12 perle. I simply used stitch buildup to replicate the look. If there’s a will, there’s a way, correct? Work the decorative shapes off the sides of some of your flowers, keeping them simple. If your machine has a needle down option, this is a good time to use it so that your work doesn’t shift at your starts and stops. You may also like to do some meandering, ending the winding trail with a filled circle. 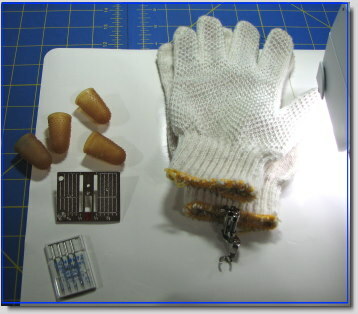 In part four, we will begin working with perle cottons #3 and #5, learn how to create a pod stitch, and conclude the second level of thread work. There has been some kind of technical issue with my WordPress blogs for the past two days. I’m sorry if pictures have not loaded correctly or you have had trouble viewing the blog. In part one, we completed the background for our flower garden. We are now ready to fill our garden with some flowers and leaves. Any fabrics that have a hand dyed or hand painted look will work well here. Also, commercial prints of large flowers would be usable. The print I used for most of my flowers had a tie-dyed floral design that allowed me to take advantage of the circular centers. I do recommend using several different colors for the sake of visual interest. Since many of these will be covered with other embellishments by the time you are finished, your fabric choices aren’t that critical. 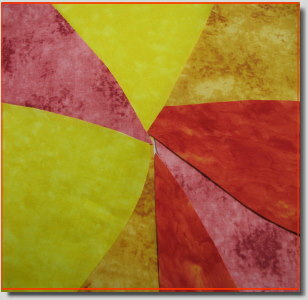 First, back your fabrics with a fusible or with a stabilizer. Which one you choose will determine how you apply them to the backing. Next, cut out some free form leaf shapes in various sizes. The number is up to you. Next, cut out some free form flowers in all different sizes. You may like to vary the shapes. Now, place the leaves and flowers on your background, and arrange them in whatever way they appear pleasing to you. 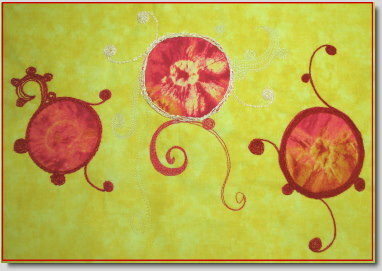 If you used a fusible, now is the time to press the shapes to your background. If your shapes were stabilized, you can apply them with basting glue, spray adhesive, or whatever way you normally apply your appliqués. 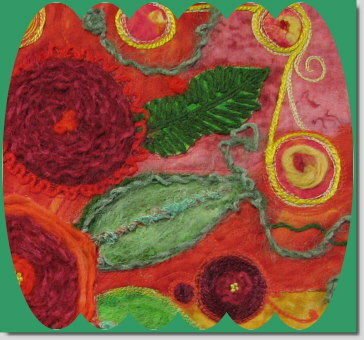 The next step involves felting wool roving onto the main leaf shapes. You can skip this step if you like. I wanted some additional texture on my four center leaves. 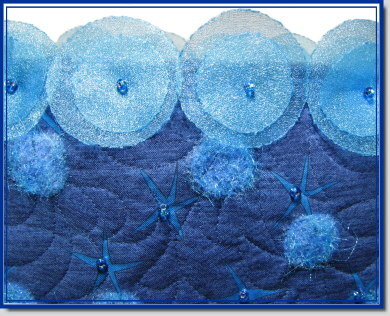 This step can be accomplished by machine needle felting or by hand felting. (Hand felting tools are available at most craft stores.) Simply take a small amount of green roving and place it on top of your leaf shape. Needle punch around the shape until the roving appears secure. The basic structure of your flower garden is now complete. Take a second look at it from a distance to make sure you are happy with the placements. If you think more leaves or flowers are needed, this is the time to add them. We now move on to the next stage and it is here that the fun begins. 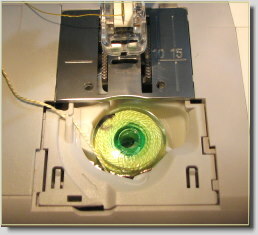 Set up your sewing machine for free motion embroidery, making sure the feed dogs are in the down position. There will be two main layers of thread work. For the first layer, I used 35 weight cotton thread. You can use any embroidery or quilting thread you like. Do use several different colors that compliment each other. 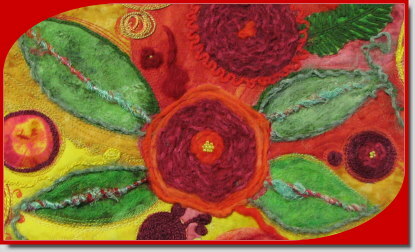 Begin with any flower or leaf and stitch around its edges. Continue doing this until every flower and leaf have been stitched down. 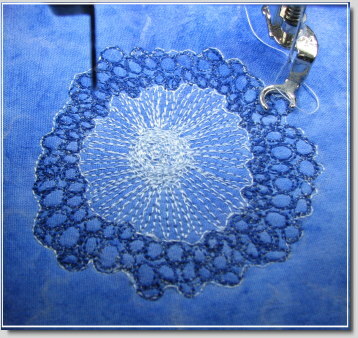 Next, choose one shape at time and think about how you would like to embellish it with stitches. Begin by stitching around its edges a second and third time and then veering out with the needle and stitching some spirals, scrolls, or circles. 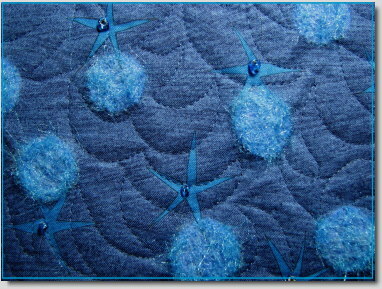 You may also like to do some echo quilting around the shape. Be as creative as you like. And remember, even little stitches do not apply here. No flower, vine, or leaf is identical to another, so your stitches don’t have to be either. In fact, uneven stitches in this piece only serve to enhance its beauty. Life is good, isn’t it? 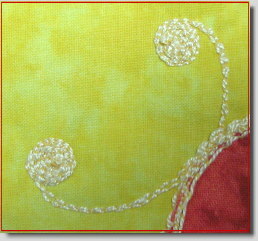 In part three, we will move on to the second layer of thread work, using perle cottons and various techniques for applying them to the surface of our work. It will be fun, I promise! Spring has arrived in the Blue Ridge Mountains and spotted the landscape with majestic purple crocuses, golden yellow daffodils, and soft white cherry blossoms. All of this beauty followed me into the studio, so out came the threads, fibers, yarns, and colorful fabrics. This multi-layered project is not for the faint of heart. However, if you hang in there, you will be rewarded with a beautiful piece of art that is worthy of your signature and a frame. Mine is actually destined to be a pillow, but you could use the following techniques for a quilt, a handbag, or any number of other items. Additionally, you could break the project down into smaller parts and use a few flowers and leaves rather than the large number that I’ve included. I also found that each stage of work looked complete in and of itself, so you could stop at any point you desired. For this fiber play, you will need some flannel and several background fabrics that are hand dyed, hand painted, or have the same look as these do. You will also need embroidery weight threads, perle cottons, roving, yarns, and embroidery floss (silk or cotton). I used silk cords and beads as well, but these are optional. 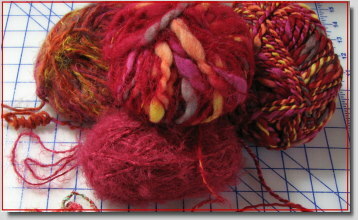 You may have some other wonderful fibers on hand that you would like to use in this project. The first stage of construction involves building your background. After deciding on the size you would like your finished project to be, cut a piece of flannel a little larger than your measurements. Then begin cutting pieces of fabric to fill the space. You can back your fabrics with a fusible or with a heavy stabilizer. If you choose a fusible backing, iron your pieces onto the flannel. If you choose a stabilizer, attach your pieces by using a little basting glue or a spray adhesive such as 505. Most everything about this project is free form. Relax and enjoy each stage, setting precision aside for another day. If there are small gaps here and there, don’t worry about it. These will be covered with a flower, a leaf, or some other decoration. When all of your background fabrics are in place, you might like to add one more layer of interfacing/stabilizer to the back. I used a light weight stabilizer that I applied to the flannel with a basting spray. The purpose of the flannel and stabilizers is to provide stability for all the stitching that will cover the surface. Also, if you decide to hand or machine felt some of your pieces (a later stage of this project), both of these backings give the fibers something with which to mesh. In part two, we will fill the background with flowers and leaves and begin the next stage: thread work. 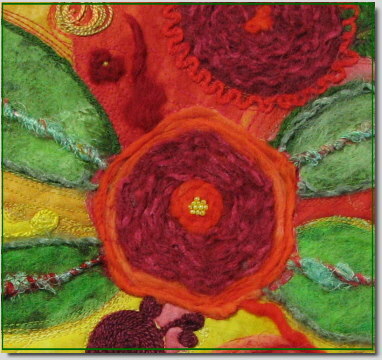 The next stage of Celtic Moon involved felting the land piece. After backing it with stabilizer, I followed the lines of the print and felted wool roving here and there, using three different shades of green. 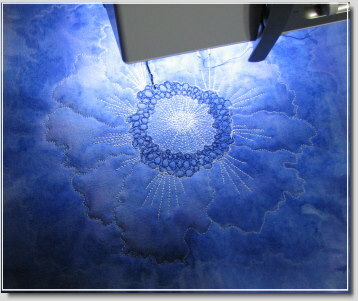 I then positioned the piece on the background and prepared my sewing machine for free motion quilting. 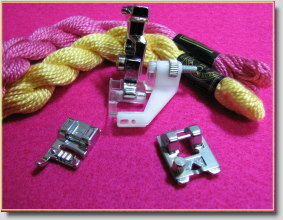 There are several items that I find helpful for machine quilting. Of course, good quality quilting needles are important. I also attach a straight stitch plate to my machine, which results in nice stitches on the back of the quilt. Sometimes I use quilting gloves (usually in the winter) and other times I prefer the banker’s tips sold in office supply stores. A newer item that I really like is the free motion slider, a Teflon sheet that allows the quilt to move freely under the needle. I chose a 35 wt. variegated cotton thread and quilted the land piece, following the general shapes on the print. 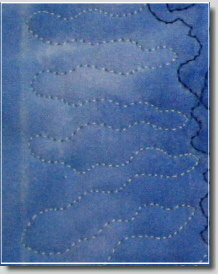 Next, I picked out another variegated thread for the water and quilted it quite densely. 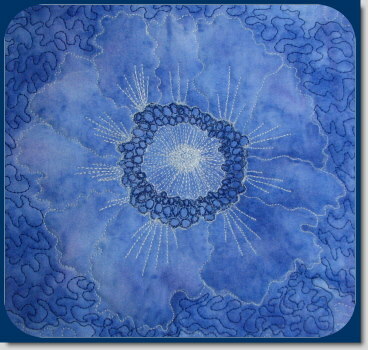 The marble design made the quilting quite easy since it already resembled the flow of water. 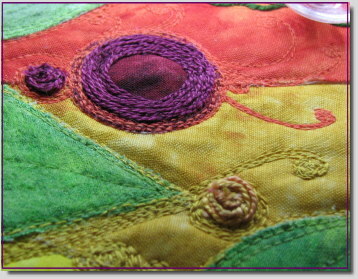 When the quilting was complete, I stitched around the Celtic garnet stitch design, which gave it the look of trapunto. The final stage of the quilt made me a little nervous. I had thought of several ways I could put a moon on the surface, but finally decided to use chiffon and a heat gun since it allowed for the background to show through and also rendered the look of the moon’s craters. Since chiffon shifts easily, I pinned my pattern on top of it and then cut around it, leaving plenty of fabric around the edges. 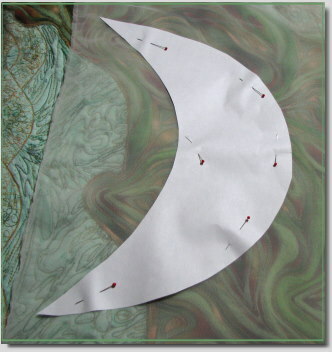 I then sewed around the moon pattern. Next, I repeated the method had I used for the Celtic design, only this time I made my circles much larger. When I completed the garnet stitches, I trimmed off the excess fabric. I took the quilt outside and used a heat gun to melt the holes in the chiffon. 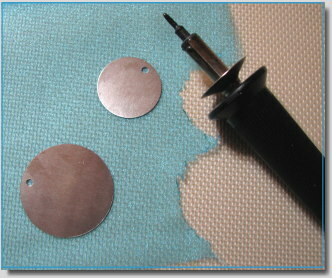 As soon as the holes would begin forming, I would move the heat gun to the next area. This is a technique that takes practice and demands careful attention. You can easily burn your fabric if you’re not careful. 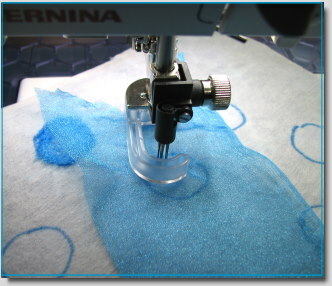 If you try this method, do a test sample first so that you know how close to position your heat gun to your fabric. To complete the moon, I painted outlines with Lumiere metallic bronze around the burned out holes. This certainly isn’t the most colorful quilt I’ve every made, but the techniques used to construct it made it a very interesting project. I hope you will try some of the methods and incorporate them into your projects. With National Quilt Day and St. Patrick’s Day falling on the same weekend, I decided to make a Celtic-themed quilt using several techniques that I think you will enjoy using in your own work. Of course, the quilt is predominantly green. It’s kind of funny. I was listening to an Alex Anderson pod cast the other day regarding color. 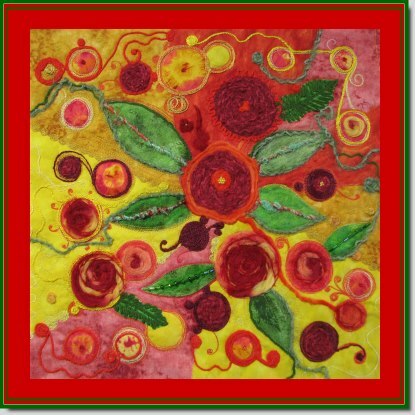 She shared how she disliked fall colors in her early quilting days but grew to appreciate all colors. Greens and browns would be my early “dislike” colors. Now I notice that the two colors show up frequently in the things I create. When I began designing this quilt, I wanted the feeling of motion to play a large part, so I chose a marbled fabric for the water background and a print with lots of fluid lines for the land. 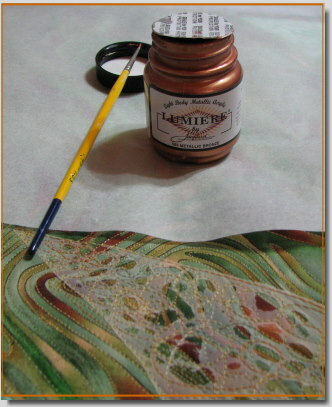 The first stage of the quilt involved the winding Celtic design. I thought about painting the design onto the fabric but decided that some kind of thread work would be a better choice. After backing the fabric with Decor Bond, I penciled in the outline of the design. 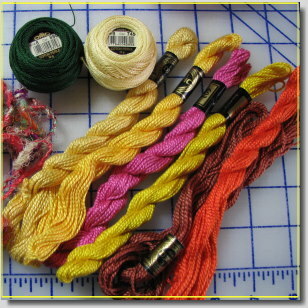 I then chose a variegated cotton thread (35 wt.) and set up my sewing machine for free motion embroidery. This technique is fun, easy to do, good practice for other kinds of free motion work, and adds a unique quality to your work. I call it a meandering garnet stitch since you work in a circular motion but alter the size and shape of your circles as you move across the fabric. You could use this technique with just about any shape imaginable. Lower the feed dogs on your sewing machine. Hoop your design and begin with a few securing stitches. Clip you thread tail. Now move the hoop in a circular motion, creating small, medium, and large circles, covering the interior of your outlined shape. 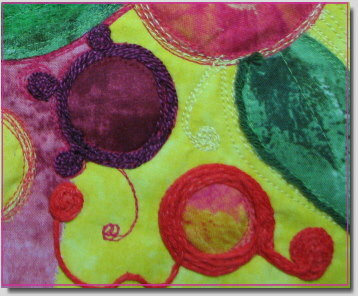 Allow some of your circles to elongate and cross over previous stitching lines, forming a web-like appearance. When the interior of your design is complete, make a few rounds of outline stitches, allowing them to build up on each pass. You can use any kind of thread you like with this technique. Decorative and metallic threads work well. 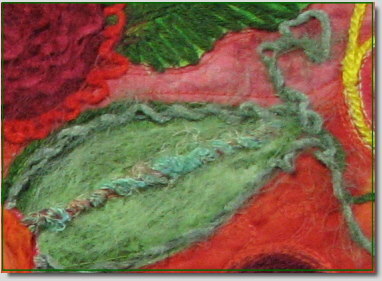 You could also sandwich fibers under tulle and then stitch the meandering garnet stitch over them. The choices are yours to make. 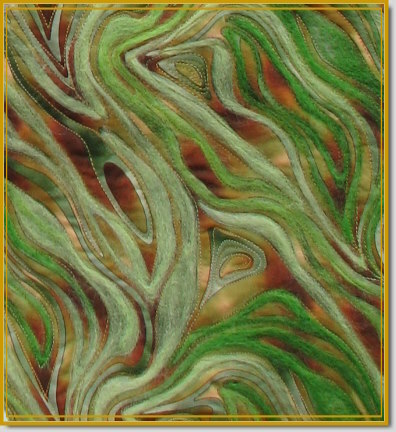 In part two, I will share with you how I machine felted the land piece, free motion quilted the water and land shapes with lots and lots of thread, and with fear and trepidation, formed the moon on the surface. My little shadow dweller started out to be an actual shadow of the blue dragonfly. The dark background fabric didn’t allow for the effect I desired, so he took on a new life as a lurker. The method I used to create him is a little different from the colorful dragonfly in part one. For this fiber play, you will need a black stabilizer, a cut piece of your background fabric, and some black polyester organza. Hoop the black stabilizer and place your background fabric on top. This time keep the most pronounced side of the fabric face up. 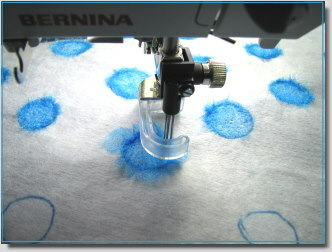 Using your Babylock Embellisher or needle punch machine/attachment, slowly tack down the fabric to the stabilizer. Next, needle punch the entire surface of the fabric. A light felting will be sufficient. Place the black organza on top of the felted fabric and secure its outer edges with your fingers. 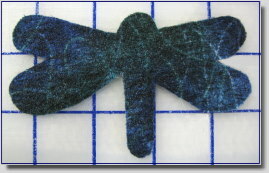 Beginning in the center, tack the organza down using a cross motion and then an “X” motion. The organza will have a tendency to fold and bunch up. Keep it as taut as possible as you work across the surface. 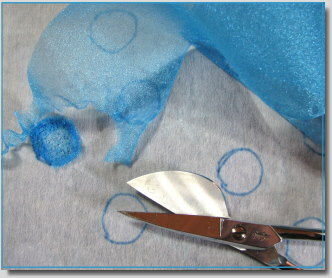 When the organza has been evenly felted, remove the design from the hoop and cut away the excess stabilizer. Unlike the first dragonfly that we made, this one will have the organza side of the piece as his front. Sandwich the piece between parchment paper or a nonstick ironing sheet. With your iron set at “cotton,” press for about 6-8 seconds. Some stabilizers will begin to melt during this process, so do this in a well ventilated area. After your felted piece cools, cut out your design shape. 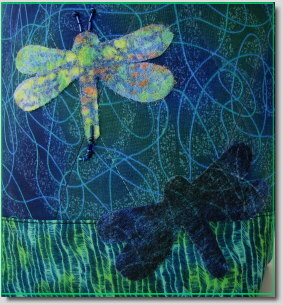 I simply put my previously made dragonfly on top of the felted piece and cut around it. Your dark dragonfly should have a hint of the background fabric showing through. This gives the appearance of translucence to his body. These shapes can be easily attached to another surface by stitching through your base fabric and catching part of their under bodies with the needle. There is no need to bring the needle and thread to the surface of the design (unless you want to, of course). I hope you enjoy this technique and find creative ways to use and expand it in your own work. I received a question yesterday from one of my wonderful readers in Austria that I would like to spend a few minutes answering. 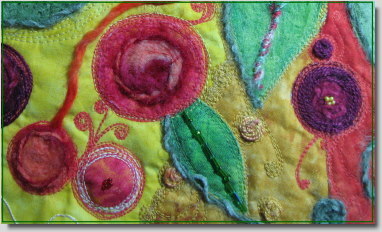 The question concerned batiks and more specifically the batiks I’ve been using in my latest tutorials. Fabric designers usually present their new lines seasonally. Batiks are a little different because many of them are imported. However, designs change rapidly and once a season or two passes it can be difficult finding a particular fabric from an earlier collection. We’ve even had people write us at Dawntreader Designs because they saw a fabric used in one of our products that they desperately wanted and couldn’t find in fabric stores or online. The fabric I use in my tutorials comes from a large inventory that has been collected over time from many different sources. I often go on buying trips to other cities to find new and interesting fabrics, fibers, and notions for the business studio. That’s my day job, so to speak. With that said, let me add that little of what I procure is exclusive to business owners or some select group. I shop just as other people shop, only I probably purchase larger quantities at any given time. I’m sorry to say that the dragonfly batik and the green leaf batik were purchased several years ago from parts unknown, and I haven’t seen them in stores for a long, long time. 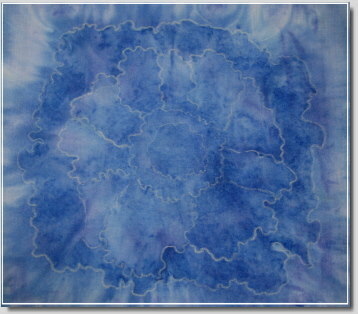 I believe the leaf design could be achieved with hand dyed or hand painted fabric. Similarly, the dragonfly could be hand painted as well. Also, another batik with a busy design could be used for the dragonfly and then cut out in the desired shape. I try to write my tutorials in such a way that the technique transcends the specific colors or fabrics that I use. It can be frustrating when a tutorial or magazine article offers a long list of esoteric supplies that are not readily available to the general reader. This isn’t always possible to avoid, but I do try to suggest alternatives for those who can’t find a specific item that I incorporated into the work. Thanks for the question. I’m just sorry I can’t point you to a source for the batiks. Keep your eyes open, though, because beautiful new batiks come to market regularly and you may just find something you like even better.